Content marketing can be a valuable marketing strategy for just about any type of business. By giving your customers and prospects actionable content through great storytelling, you can help your brand increase trust, credibility and ultimately, sales. But there’s an important caveat: the moment a brand tries to push a direct sale through its content marketing, customer trust in the content marketing plummets. This was the finding in a recent survey by CMS software company Kentico. The risk of falling off the credibility cliff doesn’t end there. Forty-nine percent of consumers will check a brand’s facts with other sources. 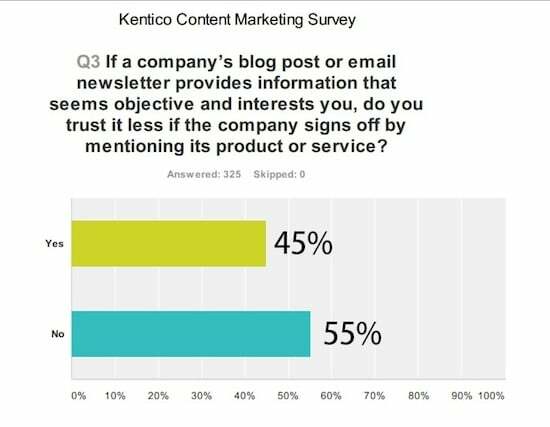 If they can’t corroborate the content with non-company sources, 46% of consumers start losing trust in the content. Not addressing multiple perspectives, talking down to readers, and not clearly stating that the content is coming from a particular brand also impede consumer trust. Interestingly, although a majority (60%) of survey respondents believed that a company’s size has no effect on the credibility of its content marketing, nearly a third of respondents believed that educational content from smaller businesses is more trustworthy than that of larger businesses. Many of you are wondering what’s more important – frequency of content or the quality of content. Both are important, but I would urge you to focus on quality first and frequency second. Remember that the goal of content marketing is a soft-sell. You’re trying to create a loyal base of readers (people who consume your content). You’re trying to build a relationship with these potential customers. Some of them might buy products and services from you. Others might recommend your products and services to their own networks. But your opportunity to sell them something at a later time is severely compromised if you add little value to the content you share with them. If the content is crap, they will have little reason to develop a relationship with you, little reason to buy your products and services, and no reason to recommend your products and services to others. If you haven’t experimented with content marketing for your business, here’s a helpful guide to get your started: How To Grow Your Business With Content Marketing.